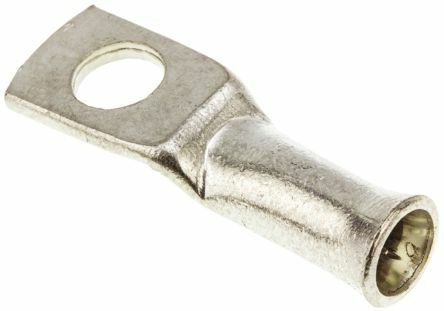 Single piece – Universal Battery Terminal. Designed to fit either the positive or the negative battery post. Suitable for crimping or soldering. Material: Tin plated brass. Cable Entry: 6 mm sq – outer dimensions. DETAILS: Cable Diameter (internal): 6mm sq AWG: #10 Stud/Tab size: 6mm (06/06), 8mm (06/08), 10mm (06/10) Termination Method: Crimp or solder Please choose size required from the drop down box. DETAILS: Cable Diameter (internal): 35mm sq AWG: #2 Stud/Tab size: 6mm (35/06), 8mm (35/08), 10mm (35/10), 12mm (35/12) Termination Method: Crimp or solder Please choose tab size from drop down box. DETAILS: Cable Diameter (internal): 25mm sq AWG: #4 Stud/Tab size: 6mm (25/06), 8mm (25/08), 10mm (25/10) Termination Method: Crimp or solder Please choose tab size from the drop down box. DETAILS: Cable Diameter (internal): 16mm sq AWG: #6 Stud/Tab size: 6mm (16/06), 8mm (16/08), 10mm (16/10) Termination Method: Crimp or solder Please choose tab size from the drop down box. DETAILS: Cable Diameter (internal): 10mm sq AWG: #8 Stud/Tab size: 6mm (10/06), 8MM (10/08), 10MM (10/10) Termination Method: Crimp or solder Please choose tab size from the drop down box.